US Secretary of Defense Robert Gates was in Beijing to discuss improving military ties between the US and China. On his arrival, the PLAAF tested their new J-20 fighter, apparently without telling President Hu Jintao. The test signalled “the military’s opposition to Gates’s trip and to U.S. efforts to improve military connections between the countries,” according to John Pomfret at the Washington Post. This apparent disconnect between China’s military and civilian leaders is causing concern in the region. To underscore the tension between the US and China, a Pew Research Center survey shows that “One-in-five Americans identify China when asked to name the country representing the greatest threat to the U.S., up from 11% in November 2009.” China tops this list of global threats, ahead of North Korea (18%) and Iran (12%), although only 22% of the population saw China as an adversary, as opposed to being a ‘serious problem’ (43%). Gates flew to Tokyo from Beijing, leaving China with little to show: rejecting a “proposal by Gates to establish a US-China dialogue on strategic stability — in other words, on the future of nuclear weapons in Asia and mutual threat perceptions related to nuclear and missile defence capabilities.” It seems a waste of an opportunity to engage the US and their fears, and makes assurances that “China is opposed to hegemony and military expansion, and it will under no circumstances be part of or trigger an arms race,” all the less believable. We can only hope that this is an attempt to keep the ball in China’s court ahead of Hu Jintao’s visit to Washington on Tuesday, where he will be given the chance to concrete his legacy. On Monday, Jan 10, Defense Ministers Toshimi Kitazawa and Kim Kwan-jin agreed to pursue an eventual Acquisition and Cross-Servicing Agreement between Japan and South Korea. They hope to finalise the ACSA by the end of the year, and it would allow for logistics sharing in joint operations (primarily UN peacekeeping operations). 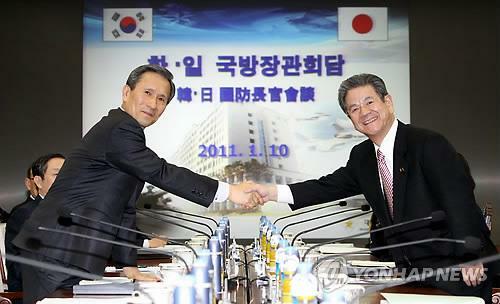 They also noted their mutual interest in a possible General Security of Military Information Agreement (GSOMIA). According to the Asahi, Japan is hoping to bring about better defense ties while President Lee Myung-bak is in office, clearly fearing a return to the antagonism of the previous president, Roh Moo-hyun. Japan clearly has designs on formalised defence ties with South Korea, beyond being on the ends of mutual security agreements with the US, and so far so good. Japan has a stake in events on the Korean Peninsula, and it is hedging towards improved regional security. The only question is whether any agreements can withstand the shock of any contingencies around Takeshima/Dokdo or the opposition entering the Blue House once more. Foreign Minister Seiji Maehara followed up on Kitazawa’s visit on Saturday to discuss trade and security cooperation between the two states. On Friday, Jan 14, Prime Minister Naoto Kan tried to relieve pressure from the opposition by ditching Chief Cabinet Secretary Yoshito Sengoku and Land, Infrastructure, Transport and Tourism Minister Sumio Mabuchi. Without the support of the opposition, Kan would be unable to pass the ¥92.4 trillion budget. In Kan’s third Cabinet reshuffle, Deputy CCS Yukio Edano replaced Sengoku, and Mabuchi was replaced by Economy, Trade and Industry Minister Akihiro Ohata. 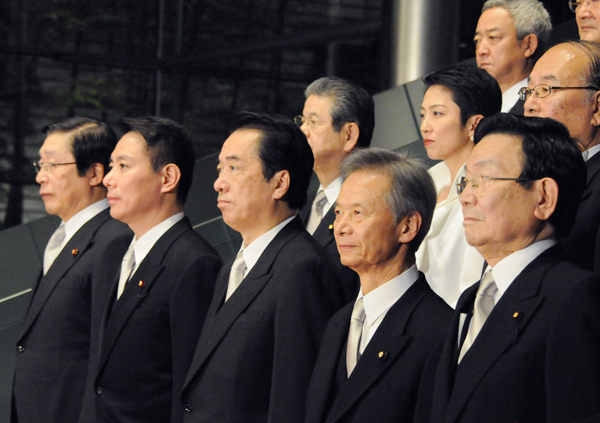 Four new ministers were brought in: Kansei Nakano replaces Tomiko Okazaki, chairwoman of the National Public Safety Commission; Satsuki Eda as Justice Minister; former Finance Minister Hirohisa Fujii takes over as Deputy CCS; and controversially, Kaoru Yosano – former LDP fiscal heavyweight and founder of the breakaway Sunrise Party (Tachiagare Nihon). News of Yosano’s appointment as Minister of State for Economic and Fiscal Policy and Minister for Comprehensive Reform of Social Security and Tax is a sign that Kan is knuckling down on tax and social security reforms. The Yomiuri also noted that Edano’s promotion signals a further attempt to marginalise the embattled former DPJ President Ichiro Ozawa. The Cabinet shuffle leaves only one woman by Kan’s side: 43-year old Renho, also the youngest member of the Cabinet. Yosano, 72, is now the joint oldest member of the Cabinet (alongside Kitazawa) and he also has the unlikely portfolio of Social Affairs and Gender Equality (also replacing Tomiko Okazaki). The reshuffle brought support for the Cabinet up to a hearty 32%, but there is already talk of what – or who – comes next. In the meantime, Kan has shown political courage in poaching Yosano, and demonstrated that he won’t back down – much like his wife already told us. Opening the door for arms exports: Kyle Mizokami over at Japan Security Watch covered Japan’s current softening towards arms exports. The issue cropped up again during Gate’s visit to Tokyo on Friday. European defence companies are already banging at the doors. China discussing stationing troops in North Korean ports? Man, you have been busy. Nice clean blog, good roundups. Looks like a lot of work, though. Abiko expects.